First, let me begin with wishing you all a very Happy New Year. I hope you all enjoyed a wonderful Christmas season and are well and happy. The first weekend of the month at the fort was wonderful. Thank you so much for all who attended and made our Old Christmas one for the books. We had well over 1,000 visitors for the weekend. 2014 was tremendous for the unit, and I am very proud of our accomplishments over this past year. Even though we did not attend Guilford Courthouse this year many of our unit branched out and attended other events. 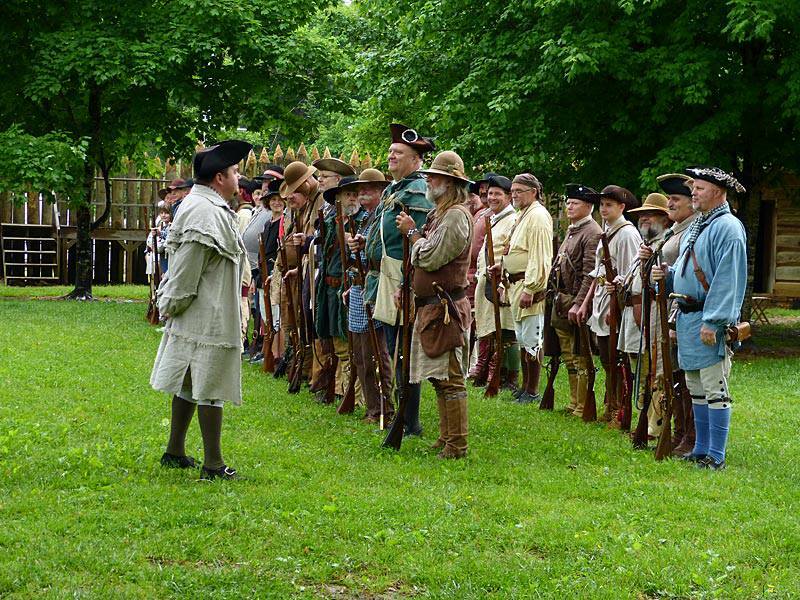 Some went to the Fort Yargo Trade Faire in Georgia, and others attended the 1812 event at Mississinewa, Indiana taking the Washington County name to new heights and locations. The May Siege was simply spectacular. Even with less than desirable weather it turned out to be the very best yet with record numbers for both participants and visitors and a great sutler’s row. In September our musicians, The Watauga Valley Fifes & Drums, were named Tennessee’s Official Fife & Drum Corps, and some in our unit were filmed for a feature documentary on PBS. A new event at the park, the “Walk in Their Boots” military timeline was a huge success and Christmas at the Carter Mansion was very successful. My sincerest and heartfelt thanks to all who have made this unit what it has become. 2014 was a banner year for the militia indeed! I am very excited about 2015. I think we will have the chance to be a part of some outstanding events and unique opportunities. We are already off to a great start with a fantastic Old Christmas event and of course with the 1812 side of our unit. 19 of our fold have recently returned from the 200th anniversary of the Battle of New Orleans. After hearing the stories and reports of those that attended, had it not been for our unit the event would have been majorly impaired. But, I am not surprised. Our people are always ready to step up to the plate and do what needs to be done to ensure the success of an event. I am so proud of you all! If we continue in that same spirit, 2015 will be an outstanding year! Along with the New Year come a few obligations that must be taken care of. Dues are due and the deadline is February 28th. Individual dues are $25.00 and family dues are $35.00. As always $10.00 of your payment goes to pay for insurance and the remainder goes into the general fund. Please remember, only Full Members pay dues. Trial Members do not. Please make checks payable to “FSSSHA” (Friends of Sycamore Shoals State Historic Area). On the memo line of the check please write “Militia Dues”. Please send dues to Sycamore Shoals State Historic Area, Attn: Washington Co. Militia 1651 W. Elk Ave. Elizabethton, TN 37643. As company clerk I am obligated to provide the unit with a yearly financial report. The 2014 quarterly reports (HAVE BEEN SENT TO THE MEMBERS WITH THIS MESSAGE IN EMAIL). Hard copies along with the 2014 receipts are available in my office at the park should anyone wish to look them over or have a copy. Thank you all so much for everything you do to make the Washington County Militia what it has become. I look forward to working and reenacting with you in the coming months. Let’s make 2015 the greatest year yet for our organization. Ken Northmore would be so proud to see the success or the drum and fife core.